Weaving the wisdom of the chakras with walking a 7 ring Cretan style labyrinth has been an interesting journey in itself. Walking the labyrinth at the solstice gave me an insight as to how I might also utilize the different therapies that I have studied into one program. 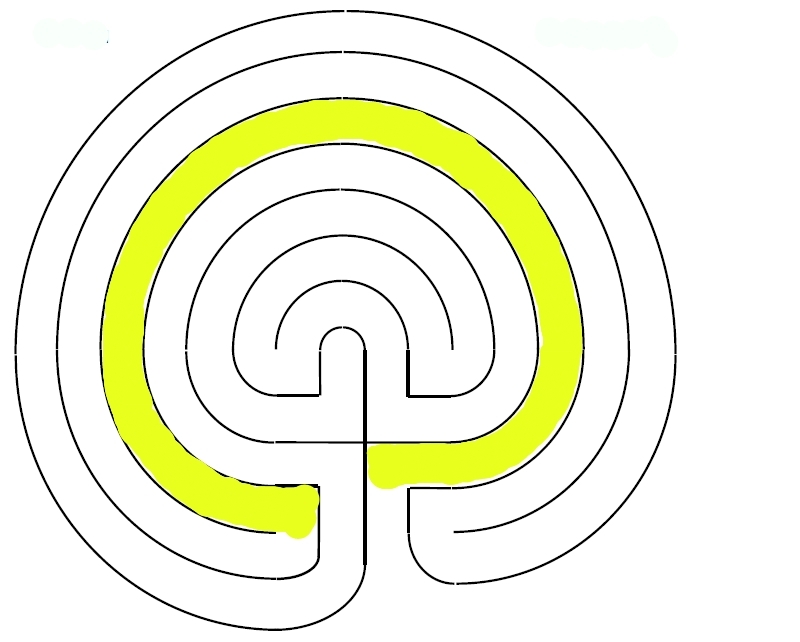 Walking the labyrinth is a reflective process and what better place to start is by entering the labyrinth and immediately finding ourselves within the circles…. not at the centre, but not yet having walked the outer rings. This can be somewhat disconcerting as the mind then begins to wander and think about where the journey may go. It’s about letting go and trusting in the journey, because there is no way to get lost within the labyrinth. Whatever emotions come up are those that we need to pay the most attention to. So the journey begins…. discovering that this corresponds with Solar Plexus Chakra which is in the centre of the body like a radiant sun. This is the seat of our personal power…. the yellow colour is thought to strengthen the nervous and the immune systems. It is closely linked to our emotional life, creativity and our self esteem. It’s about courage and power and your ability to succeed in the wider world. Are you holding onto any unconscious or unhelpful beliefs that are holding you back? If so, then Hypnotherapy will be of service to you! The spiritual message of the colour yellow is to trust and be guided by your intuition. Because of it’s association with the sun, the element is fire and this may be exhibited with the emotion of anger or resentment. The opposite of this is forgiveness and letting go making this an ideal place to begin….. 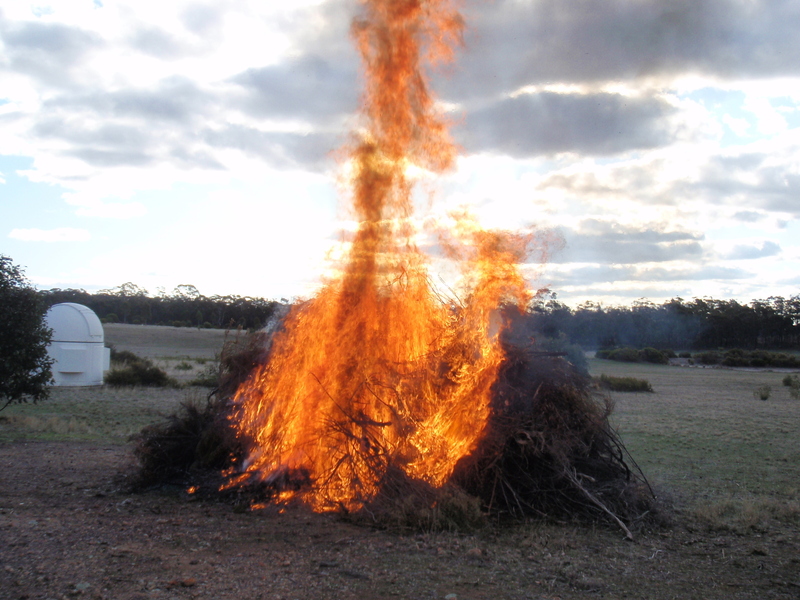 The intent was to celebrate as close as possible to the Winter Solstice…. there are people who get a little pedantic about actual time. According to a site I checked, actual time would be on Monday 22nd at 2.39am and I wasn’t going to be at the retreat, let alone getting up at that time of the morning in the frosty weather! For a couple of months we have been gathering bushes that were taken off the fence lines and carting them to a central site. 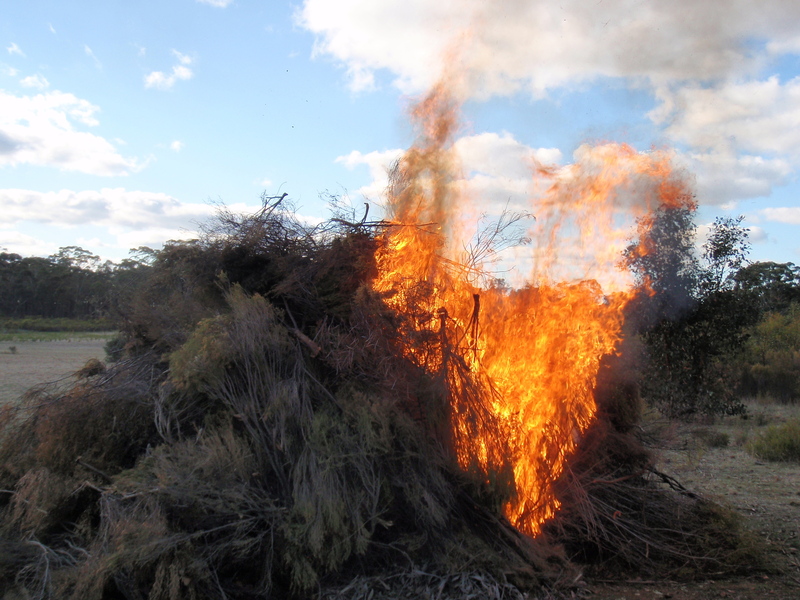 Very aware that the biddy bush is highly flammable, the fire trailer was topped up with water from the dam and parked nearby. 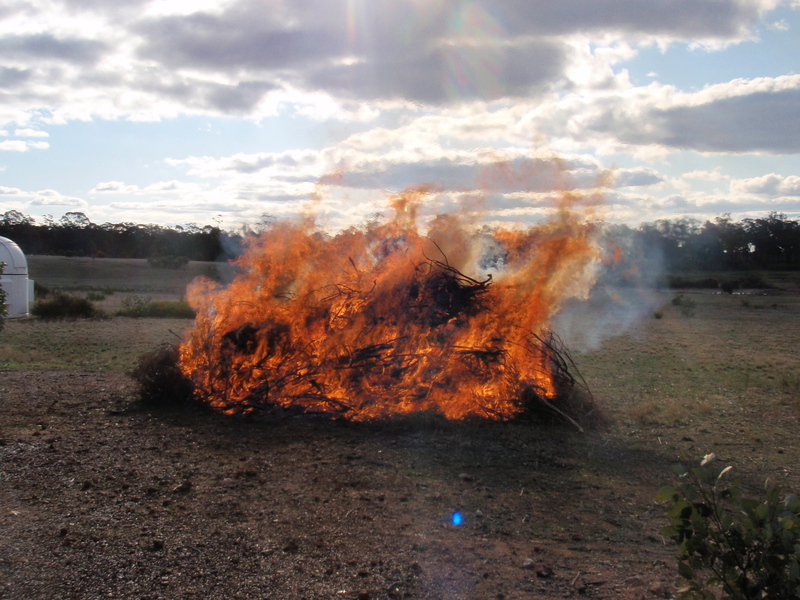 It was decided to light the fire on the Saturday afternoon, so that we had time to tend to the ashes and coals in daylight. 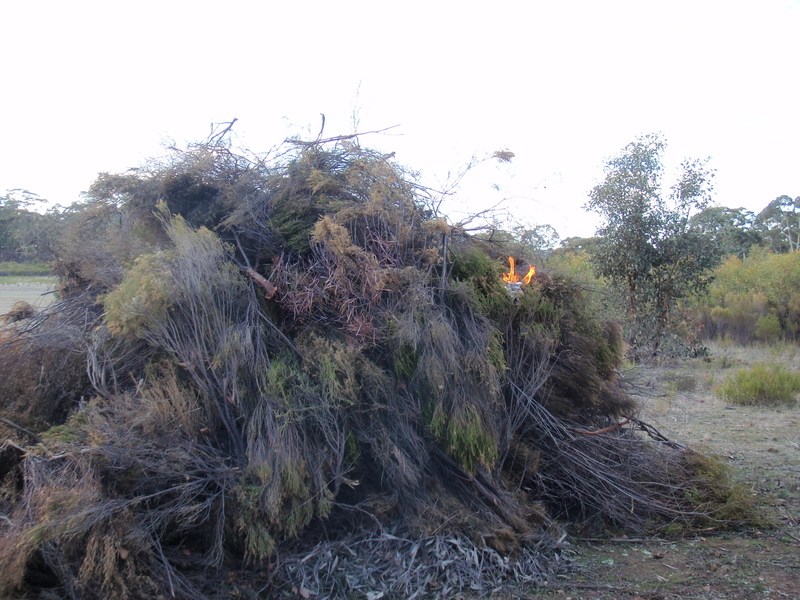 The last bonfire took about 6 hours to look after and was fortunately in a damp area where the dam overflows. This year has been very dry and we wanted to make sure no sparks blew over our neighbour’s property which is covered in these bushes. Around the 5 minute mark, we had to move the fire trailer as the heat from the fire was so intense that the metal was too hot to touch and the plastic IBC tank was in danger of melting. A new appreciation for the CFA crews who have to attend fires in this area!! 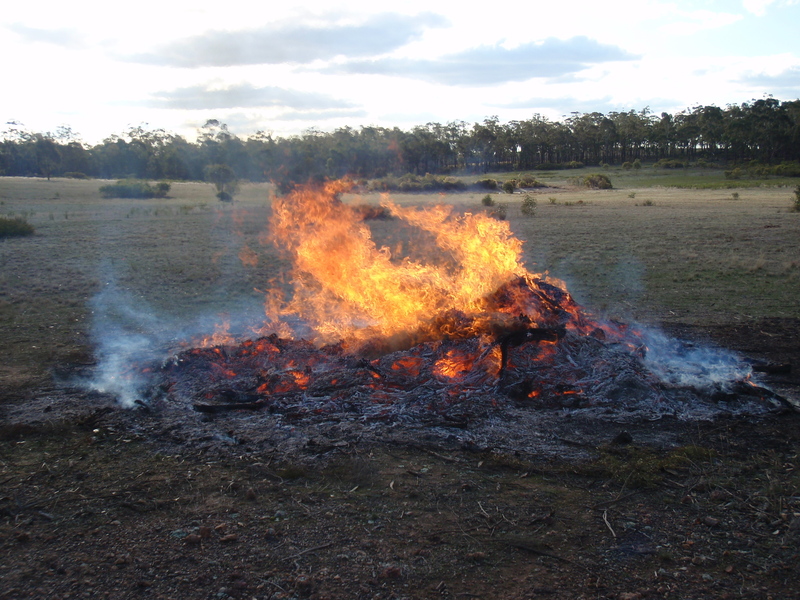 The fire burned so quickly that there was very little left in the way of coals and what did remain was raked to the centre and checked on a regular basis. Just barely warm ash remained by Sunday morning which was very frosty and the temperature hovering around -1C. 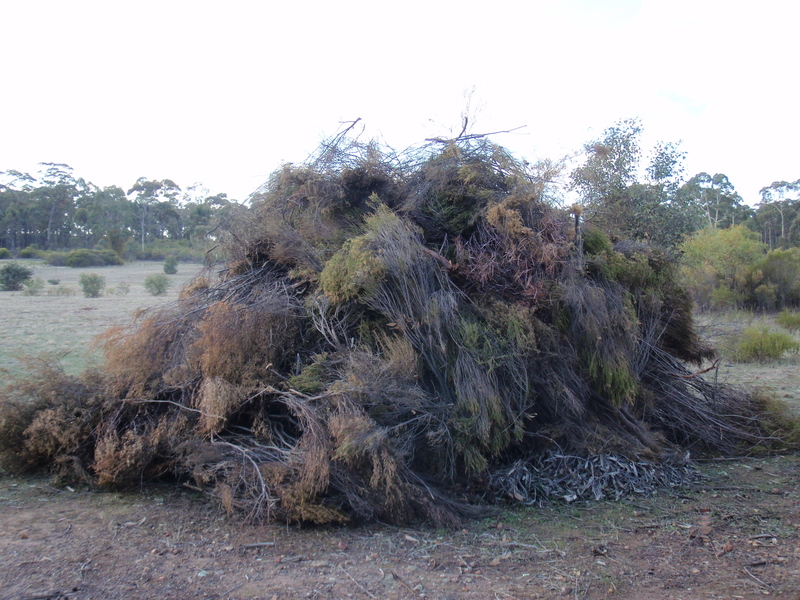 I had already walked the big labyrinth after we arrived on Saturday, which is located just behind the bushes near the bonfire pile, in preparation for the Winter Solstice. I noticed that the recent rains had left water in the plinth in the centre, and the kangaroos and hares had finished off what was left of the sage – even to the extent of digging up the roots they had left from their previous feasting. Our guest for the evening arrived and it was time to start cooking on the campfire nearer the cottage. Foil wrapped potatoes and beetroot and a lamb roast. The temperature was dropping rapidly and even though there were some bigger logs on this fire and the stars were magnificent to look at, there came a time when it was prudent to retreat to the warmth inside. The water in both the handwashing basin and the centre plinth of the labyrinth was frozen and the big labyrinth looked magnificent in its frosty glory. Even by 10am the temperature had barely moved above 0C, so there was nothing else to do except keep walking…. this time in the smaller labyrinth near the shed. No surprises what turned up in the photo! Many years ago I was a strict vegetarian and still do prefer a vegetable based diet. Camping in remote areas and travelling through fruit fly checks meant that it was difficult to have a good supply of vegetables and fruit. Dehydrated meals, apart from the extra water needed, are for the whole pretty bland and disgusting. Often I will request a vegetarian meal at a function, not because I’m being contrary, but because I’m just not eating meat at the time. Invariably disappointment follows. Surely most chefs have some imagination and understand the key part of the word “vegetarian”. A square of commercial puff pastry that contained still partially frozen mixed vegetables – peas, corn and carrots at a venue in bayside Melbourne that was noted for fine dining. Fish and chips! 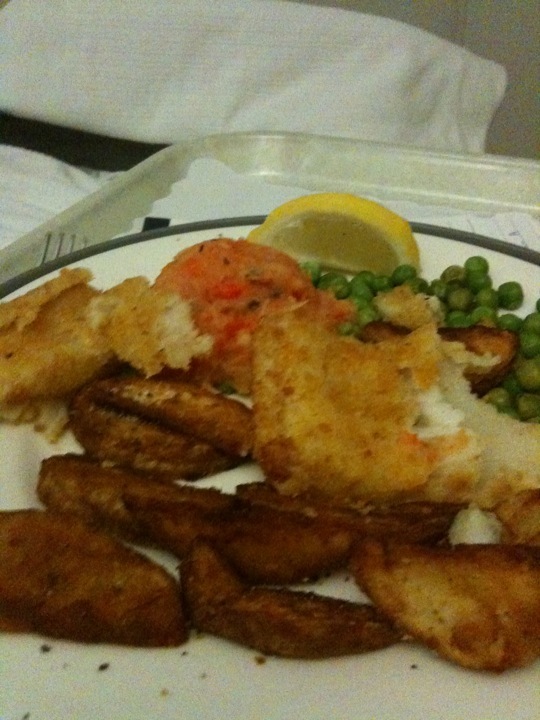 Yes, this was served up as a “vegetarian meal” in the cardiac ward of a private hospital. Of course! Potatoes, peas and carrots are vegetables. 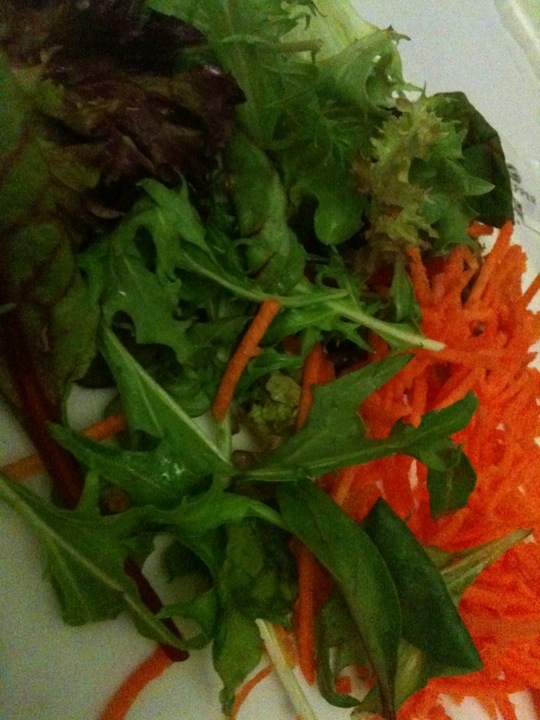 The replacement meal when I asked for vegetables (and I don’t think I was bei ng difficult) was a handful of mixed salad leaves and some grated carrot. The kitchen staff kindly offered to add some chicken for flavour! Breakfast the next morning was inedible. Fruit that had begun the decaying process long before it was placed on the plate and served up. Recently I have been to a couple of functions. On booking for both, I specified vegetarian. Lunch was served and the usual alternate plates of red meat/white meat were offered. The vegetarian option when it eventually arrived was a pumpkin risotto… sigh….. this has happened before…… load the plate up with gluggy rice, mash some pumpkin through and chuck some Parmesan cheese on top. I do concede that rice is a grain, but not a whole grain. Next event was an evening meal. Entree was a tomato and basil soup. Not bad! Main course for the rest was a glutinous mound of shiny mashed potato and a beef stew, purporting to be goulash. My vegetarian plate came out and you could smell the garlic at three paces….. oh dear! A large bowl of penne, with a drizzle of tomato paste and liberally mixed with chopped garlic. There wasn’t anyway to scrape it off… it was if the chef had accidently slipped and tipped about a half a jar of minced garlic into the bowl… it was on the penne, in the penne … everywhere… and seriously inedible. I wish I had taken a photo of it. The organizer had noticed I wasn’t eating and enquired…. she came over to inspect the plate and agreed that she wouldn’t be able to eat the meal either. A replacement meal was organized and credit where credit is due… was delicious. The chef had used some imagination and gone wild with the vegetables! Tofu, stirfried broccoli, carrots, onions and a spicy sauce over Hokkien noodles and topped with crispy onion bits. I did have a bit of a chuckle when the wait staff asked as I was leaving, if the dish wasn’t too spicy for me…… they weren’t to know that I eat lots of very hot chilli!! Vegetarian meals in mainstream restaurants don’t have to be boring or difficult….or even an overload of carbs…… A seasonal warm winter dish of roasted vegetables….. potatoes, pumpkin, beetroot, carrot served with a cauliflower “rice. Stirfries with a mix of seasonal vegetables and a touch of tofu. Salads with a variety of leaves and other vegetables, seasoned with herb dressings.